If you're looking to book a cruise for later in 2010, how about going somewhere a little different? 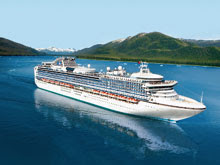 In September 2010, the Diamond Princess will sail from Whittier to Singapore, taking in the following destinations: Muroran, Vladivostok, Pusan, Qingdao, Dalian, Xingang, Pusan, Nagasaki, Shanghai, Hong Kong, Nha Trang, Ho Chi Minh City (Phu My), Laem Chabang and Koh Samui. And right now you can save up to 27% on some fares. "Hundreds of tourists flooded into Christchurch yesterday as one of the world's biggest cruise ships docked at Lyttelton. The Diamond Princess arrived with 2674 passengers and 1072 crew. The liner is one of 14 booked to arrive at Lyttelton this month. Lyttelton Port of Christchurch chief executive Peter Davie said cruise ships such as the Diamond Princess provided a big boost for Canterbury tourism. "When a larger ship like this comes in there can be up to 2500 passengers, and for a day they're enjoying the sights and all that's available to them in Canterbury."